Cities Connection Project | RESIDENTIAL BUILDING. GENEVA. In the Geneva’s International district, the density, alignments, heights and proportions of the building context have generated a plan, which reduce the frontality with neighboring buildings. The diagonal is used as the main direction into empty spaces. The ‘’pedestrian’’ entrance, under the shape of a hole in the building base, leads to a halfglazed hall on two levels, which also provides natural light to the inside parking access. The building consists of studios, two-roomed, 4.5 rooms, 6.5 rooms apartments and 7 rooms’ duplex on the top floors. The typologies provide rooms of great dimensions, allow an important open living environment, extended by large balconies, to enhance the perspective on the immediate and distant landscape. 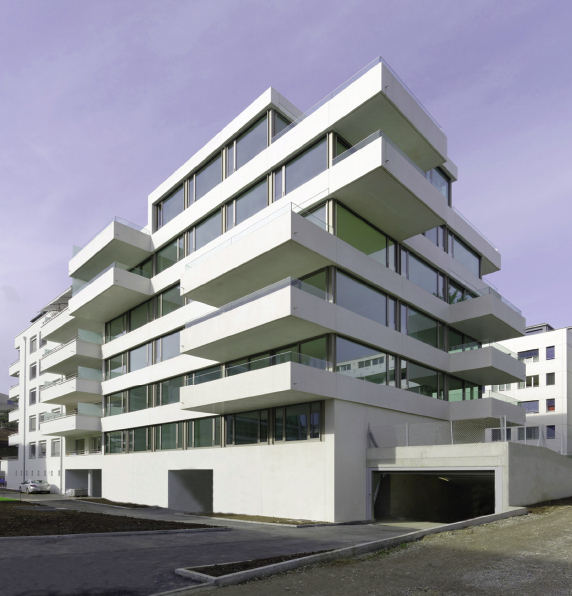 The facade, composed of precast concrete panels, transforms itself into balconies and continuous large windows. This leads to a great flexibility in the integration of various typologies. The non-overlapping balconies and their rhythm suggest a dynamic volume’s rotation and enhance the concept of the plan ‘’diagonality’’, which characterize the apartments unity.